For people unhappy about having crooked, crowded, gapped or misaligned teeth, the traditional braces method of correction is no longer the only option. As evidence of the technological breakthroughs in dentistry, Invisalign in Viera now offers a more discreet way to receive a dream smile. Still, you’d like to know more about how the process works. Read on to get the answers to 4 frequently-asked questions about orthodontic treatment with Invisalign! Instead of relying on metal brackets, wires and bands to adjust teeth, the Invisalign method uses a series of custom-designed clear plastic trays to comfortably and gradually move the teeth to their correct position. Because of their clear, low-profile design, the trays are virtually unnoticeable when worn. You’ll be able to maintain a normal diet because the trays are removable. The treatment time is usually shorter than the traditional braces route. While the above traits are attractive, there are some specific questions that still need to be addressed. #1 – I’m currently wearing braces. Can I make the switch to Invisalign treatment? Even though you’re currently wearing braces, there is a chance you could have them removed and still undergo the Invisalign process. However, you’ll first need to be examined by your dentist to make sure this will be a good fit for you. #2 – Since having my braces removed, my teeth have shifted. Can Invisalign treatment fix this? Even after you’ve undergone orthodontic treatment with braces, your teeth are still vulnerable to shifting. A more immediate reason for this is usually a failure to wear retainers properly. Thankfully, all hope isn’t lost. 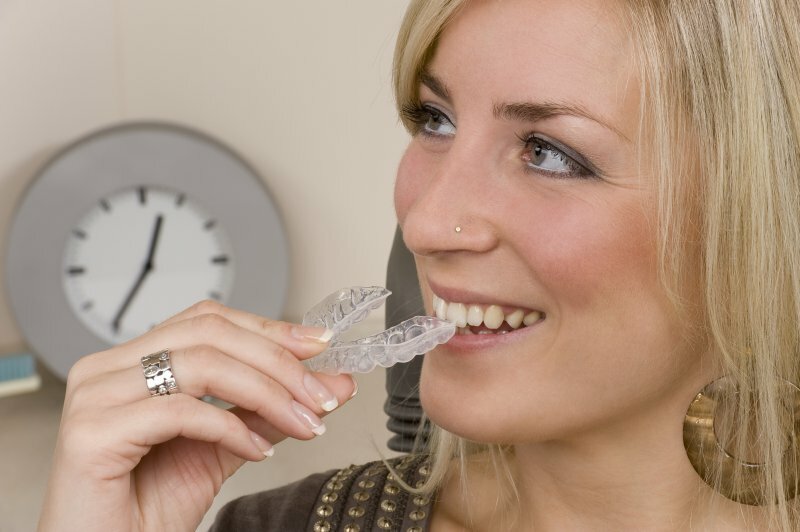 The Invisalign method can be used to straighten your teeth again. Then, when the process concludes, your dentist will instruct you on how to properly use your retainer to allow for new bone to grow. #3 – I have veneers or crowns. Will Invisalign clear trays work with them? Typically, it’s not the best idea to have your bite adjusted after having either veneers or crowns placed. That’s because the shifting that occurs can cause the fixtures to unseat or dislodge. To get a definitive answer, though, visit your local dentist for an examination. #4 – I have bridgework on several teeth. Will Invisalign still work? If you’ve had bridgework done, there’s a chance that Invisalign won’t be the best fit. Again, the shifting that occurs when you are teeth are being adjusted, could be problematic. When you visit your dentist for a consultation, though, the appropriate strategy can be developed to accommodate your specific needs. Correcting your bite not only improves your appearance, but it also allows for better functionality and jaw health. So to find out if you’re eligible for Invisalign to create your dream smile, contact your dentist in Viera to schedule a visit today! Dr. Cedric Chenet earned his dental degree from Howard University. After graduating, he went on to serve his country as a dental officer in the US Air Force. With nearly 40 years of experience practicing dentistry, Dr. Chenet helps patients achieve dazzling smiles with Invisalign at his private practice. He can be reached for more information through his website.